How does consideration of women’s and men’s uses of and benefits from forest and tree resources make a difference for successful agroforestry strategies targeting climate change adaptation and mitigation? This was a key question addressed by a recent webinar on “Gender, Agroforestry and Climate Change in Latin America,” carried out through the CGIAR Research Program on Forests, Trees and Agroforestry (FTA), and coordinated by the International Center for Tropical Agriculture (CIAT) and the World Agroforestry Center (ICRAF). 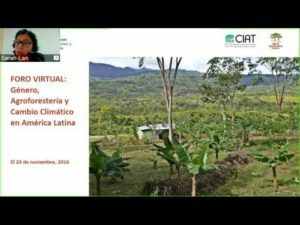 The webinar shared insights from ICRAF and CIAT research projects in sites in South and Central America in order to support decision-makers and development practitioners in the region to integrate gender concerns in climate change policy-making and interventions. Participants represented government agencies, non-governmental organizations (NGOs) and research institutions from 13 countries. 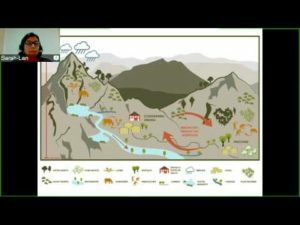 The first theme of the webinar focused on “Agroforestry for climate change adaptation in the Andes: Designing inclusive options based on local knowledge,” presented by Sarah-Lan Mathez of ICRAF. Research carried out via participatory methodologies with indigenous communities in the Peruvian Andes shows that both men and women have developed important knowledge of how to use woody plants and trees for adaptation to local effects of climate change. In particular, results show that men and women may differently perceive the benefits from certain agroforestry practices. In general, the tree species most valued by men and women tend to be those that give multiple uses, that do not harm other crops, and that are indigenous to the area. A second theme, presented by Tatiana Gumucio of CIAT, looked at “Gender and smallholder shade coffee production in Nicaragua: Considerations for agroforestry and climate change interventions.” The study focused on trends in the uses and the importance that men and women associate with various types of trees on farms in the shade coffee-producing region of Tuma la Dalia, Nicaragua. Results suggest that uses and importance can vary between men and women, by land area, and by involvement in coffee cultivation. Decision-making patterns concerning trees on farms also show that women’s involvement in decision-making can be limited depending on the type of tree. The presentations stimulated a discussion of key questions for gender and climate change interventions, for instance: how to involve the public sector in diffusion of research results and how to integrate a gender perspective in climate change planning in practice. The Andean study provided a useful example of research conducted in coordination with not just public institutions but also with civil society organizations, by including local authorities and NGOs at various points along the way of the research process. Panelists also affirmed the importance of including diverse local voices in the design of adaptation and mitigation actions in order to promote planning that truly takes into account women’s and men’s needs and preferences. Furthermore, the discussion highlighted the need to understand women’s limitations to participate in formal decision-making processes, for instance due to demanding work schedules and constraints to take on leadership roles. Firstly, it is crucial to recognize that different social groups—indigenous groups, men and women—can contribute different, specialized agro-ecological knowledge to climate change planning. Secondly, actions must be based on local information, not just in terms of land use characteristics but also in livelihood strategies and preferences. Finally, these considerations are important not only to take into account the interests and needs of different social groups but also to ensure more effective strategies and plans to tackle climate change.